If you’re clutching your cup of tea and wondering how you’re going to push on with Monday, we’ve got some royal cuteness to restore your faith in wholesome goodness – and get you motivated to face the week. Photographer Matt Holyoak snapped these gorgeous shots of the royal family looking very relaxed and delighted to have Prince Louis in their ranks. Wee Prince Louis Arthur Charles of Cambridge arrived on April 23 making him just shy of three months old. He was christened on July 9 in an intimate ceremony at Royal Chapel at St James’s Palace. While the Queen and Prince Philip were unable to attend, plenty of other family members and friends strode into the church to celebrate this fresh addition to the monarchy. As they released the shots just an hour or so ago, in an exciting quadruple-barred social media blast, Kensington Palace revealed the photos were taken at Louis’ grandpa Prince Charles’ home. 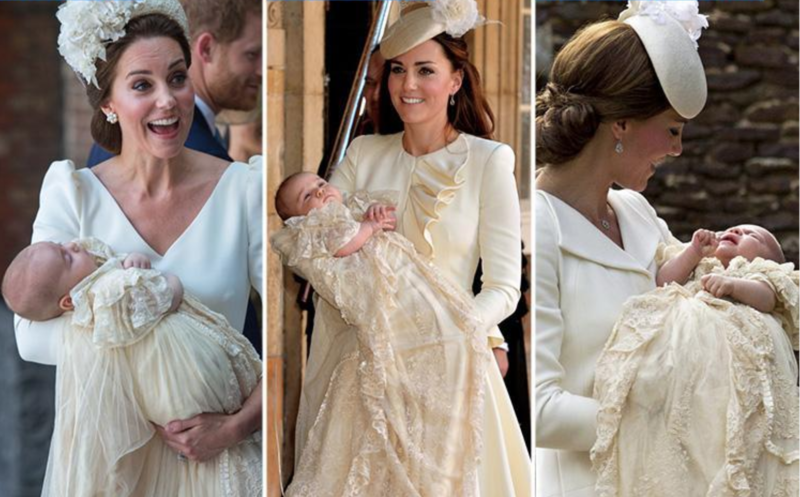 Is it so that the baby and christening gown are the focus – rather than a more colourful Kate frock? Is it so Kate matches her baby’s gown? Is it because it’s a safe option and won’t draw too much criticism? Is it a nod to one of Princess Diana’s favourite flowers – the white rose? Is it because she has a Picnic at Hanging Rock obsession? Is it because she really, really loves white and cream? Is it because the colours denote purity and innocence – qualities new babies have in spades? It’s also an opportunity to get all warm and fuzzy over how appealing and cheery this now family of five is.